U.S. retail sales of Class 8 trucks in November were 21,302, up 21.8% compared with a year earlier, WardsAuto.com reported. In the 2017 period, Class 8 sales were 17,488. “The OEMs have figured out how to build a higher number and figured out how to get those trucks delivered. The fleets need them. It’s really good news that the market continues to be strong,” said Don Ake, vice president, commercial vehicles, at the research firm FTR. “This is kind of a very normal functioning market at a very strong level,” he added. Year-to-date, sales rose 32.1% to 224,508, according to Ward’s. November was the sixth consecutive month of sales above the 20,000 threshold. Only once in 2017 and once in 2016 did sales manage to clear that mark. All truck makers posted gains this November, with Volvo Trucks North America increasing sales 60.4%, the most year-over-year. “We’re growing market share in a growing market,” VTNA President Peter Voorhoeve said recently at an industry press roundtable. He assumed the post Sept. 1. Sales at VTNA reached 2,198 units, good for a 10.3% share. A year earlier, its share was 7.8% on sales of 1,370, according to Ward’s. VTNA is a unit of Volvo Group, as is Mack Trucks. Mack earned a 6.8% share on sales of 1,450. At the same time, four truck brands from two different parent companies, when combined, controlled a 72.7% share of the market for the month. Daimler Trucks North America’s Freightliner and Western Star brands combined for a 42% share. Freightliner, the market leader, sold 8,429 units, earning a 39.6% share. Western Star brand posted sales of 510, or a 2.4% share. The other two brands, Paccar Inc.’s Kenworth Truck Co. and Peterbilt Motors Co., together earned a 30.7% share. Kenworth sold 3,185, or a 15% share. Peterbilt notched 3,336 and a 15.7% share. “We are selling everything we can get our hands on, that’s for sure,” said Steve Owens, general manager of Rush Truck Center San Antonio, a Peterbilt and Hino Trucks dealership. “And 2019 is going to be a banner year. It’s just a matter of the build capacity. 2020 is kind of an open question right now,” he said. International Truck, a brand of Navistar Inc., had sales of 2,194. That gave it a 10.3% share. “From an industry perspective, 2019 is shaping up as another very good year. Freight demand and carrier profit are both strong. 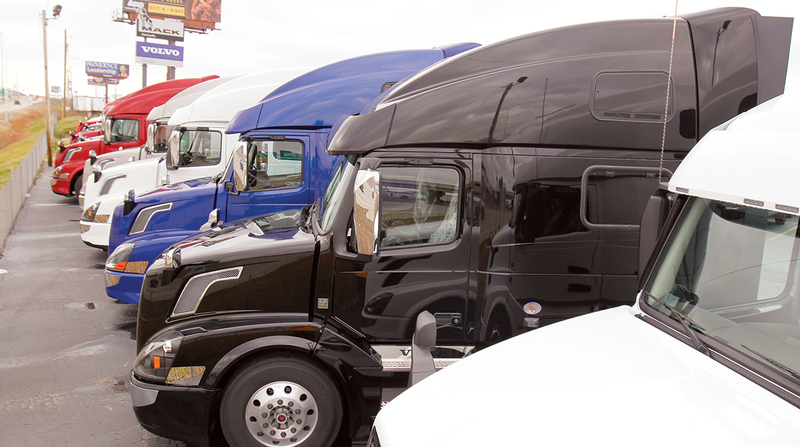 Current forecasts indicate Class 8 sales will remain well above replacement demand through [next] year,” Navistar International Corp. Chairman and CEO Troy Clarke, said during a recent fiscal year-end earnings call. “Our backlog is three-times higher than it was this time last year. In response to this demand, we have increased production, yet again, by adding a second shift at the Escobedo plant,” he said. “Every A26 we sell is incremental market share,” he added. Navistar introduced its 12.4-liter engine for over-the-road trucks in February 2017. Clarke said strong demand led to “dramatic” declines in dealer inventories, and supply chain constraints caused the truck maker to prioritize customer deliveries ahead of dealer stocks. But those dealer stocks “are now returning to normalized levels as we work through backlog,” he said. Meanwhile, Navistar dealers noted in a recent survey, by Buckingham Research Group, that their production lead-times are significantly shorter than some of its competitors, which is one of the primary reasons that they believe that they will be able to gain market share in 2019.